Tempo Tee: Over the past few months, I've added the women's New Balance Tempo Tee to my running wardrobe and I can safely say I will never go back to the typical cotton t-shirt. The Tempo Tee is a great basic piece that really moves with you when you run. It doesn't stick to you as you work up a sweat. The Lightning Dry fabrication does exactly what the name says it will do, keep you dry...fast. The only downside to the Tempo Tee: if you purchase the white color (which I own) it tends to dull slightly in your typical sweat/heat zones. If you wash it frequently though, you shouldn't have too much trouble keeping it gleaming white. 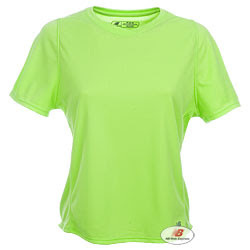 Has anyone else gone from wearing cotton t-shirts to performance fabrics recently? Quite a difference! Bonita Run Skirt: I've also added the Bonita Run Skirt to my weekly rotation of running clothes, and this skirt is a cute alternative to typical running shorts. It actually has compression shorts underneath, so it really feels more like shorts than a skirt, but a more casual look for running. It is very comfortable, and the skirt doesn't irritate your middle thigh area like running shorts. The material is quick-drying and very lightweight. The shorts underneath make it very comfortable, even for long distances. The downside of the Run Skirt: If you have solely worn running shorts, you may have to get used to idea of running in a skirt. It actually looks more like a tennis skirt. After a run one evening, I ran into the grocery store on my way home from the park and someone asked me where I play tennis...it really does look similar to a tennis skirt. But this skirt is definitely made for running with the front pleats for forward motion, than the side pleats on a tennis skirt. Have any other ladies tried running in a run skirt? Do you like running skirts more than running shorts? I wear both, but the Bonita Run Skirt could be a cute and fun addition to your typical running clothes.